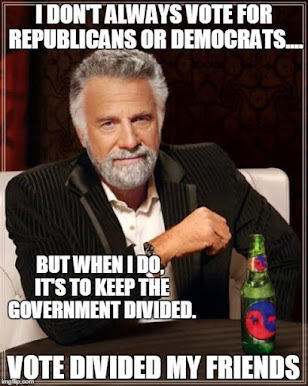 The Dividist Papers: Live by the pen. Die by the pen. Live by the pen. Die by the pen. 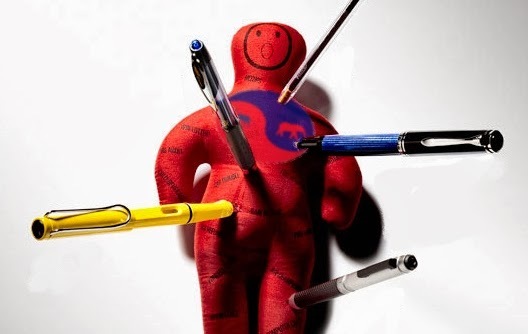 Is the pen mightier than divided government? 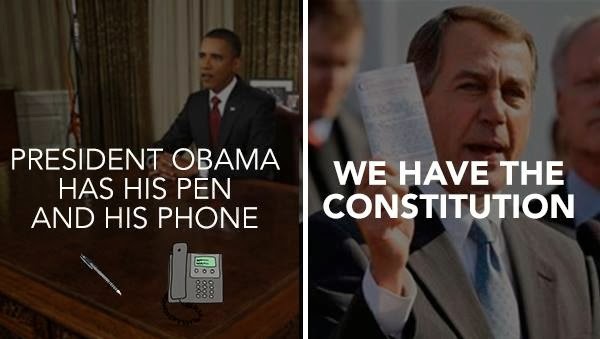 "Obama, a former constitutional law lecturer, was once skeptical of the aggressive use of presidential power. During the 2008 campaign, he accused President George W. Bush of regularly circumventing Congress. Yet as president, Obama has grown increasingly bold in his own use of executive action, at times to controversial effect. Early in his presidency, Obama also expanded presidential warmaking powers, surveillance of the American public, and extrajudicial drone strikes on alleged terrorists outside the United States, including Americans – going beyond Mr. Bush's own global war on terror following 9/11... Obama's claims of executive authority have infuriated opponents, while emboldening supporters to demand more on a range of issues, from immigration and gay rights to the minimum wage and Guantánamo Bay prison camp." "Elections have consequences The main message of the last two elections (or three - given the strong likelihood voters will keep the government divided in the 2014 midterms) is that the American electorate do not want President Obama to have the power to unilaterally impose his partisan agenda nor arbitrarily "tailor laws based on his judgment and discretion"
We have also been a frequent critic of President Obama standing on a platform of expansive powers claimed by the Bush/Cheney Unitary Executive legal construct only to champion claims of even broader executive power. To whit, the power to: indefinitely detain or kill citizens without judicial review; expand surveillance of Americans; and execute unilateral war actions without congressional approval. 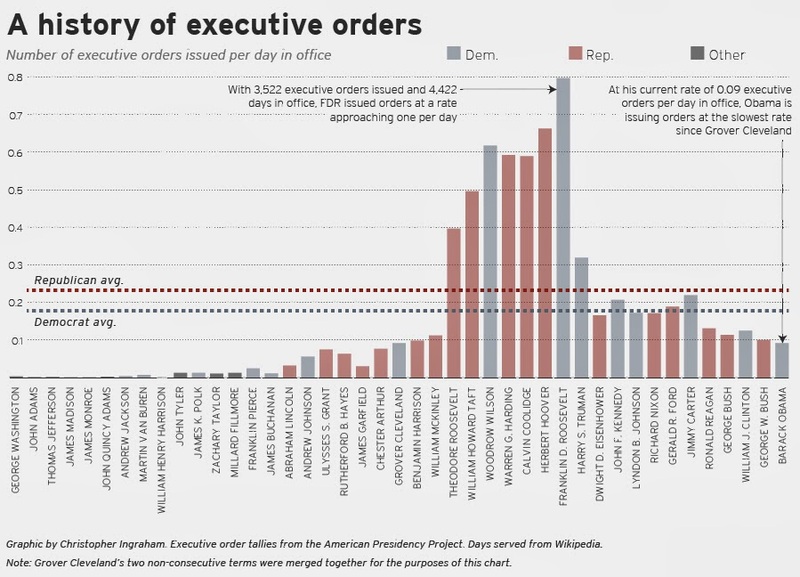 Compared to these examples of presidential overreach, a few executive orders seem like small potatoes. Indeed, after listening to the President's State Of The Union, and reviewing the accompanying batch of executive orders, we are considerably more sanguine about the prospect. Is this angst over the most recent presidential power grab really justified? How concerned should we be by the President's promise to govern by Executive Order? As an example - President Obama's executive order increasing the minimum wage to $10.10 for future federal contracts received the most media attention. The details were truly underwhelming. Business Week noted that in Washington DC, "the only job categories with official prevailing hourly wages below $10.10 are related to laundry ($9.88) and waitressing ($9.70)" and John Boehner thought the effect was "close to zero". As BBC's Katty Kay put it "He can't do very much by himself, that's not the way the system was set up. He can tinker around the edges." Exactly so. The way "the system was set up" is that we have three co-equal branches of government and constitutional checks are built into the system specifically to keep the executive from doing very much by himself. That's a good thing. Over the years, our congressional representatives have been too compliant letting the executive branch subsume more and more of what should be legislative branch responsibilities. That's a bad thing. The accretion of power to the executive branch worsens when the majority party in Congress is the same party as the executive. Congressional legislators of both parties are only too willing to put partisan considerations ahead of their institutional loyalty and constitutional responsibilities. 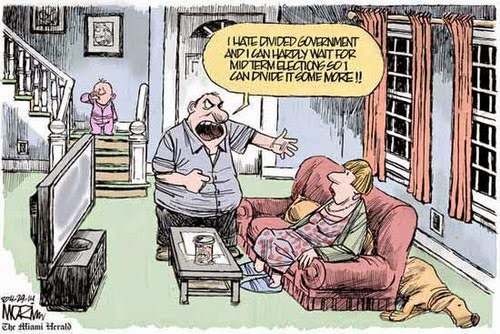 This another good reason to always vote for divided government. Turf wars precipitated by presidential abuse of executive orders are usually fought between the executive and legislative branch. These border disputes are adjudicated by the third branch and ultimately the Supreme Court. It can take a while but eventually the judicial branch can be relied upon to reaffirm constitutional limitations on presidential power. To date, the Obama administration has an extraordinarily bad track record before the Supreme Court when defending executive overreach. The only thing worse than losing 2/3 of their cases, is losing their arguments by a 9-0 unanimous decision, which they do frequently. When the Supremes render a 9-0 decision against the administration they are saying it is a case that should have never been brought before them. It calls into question either the competence or political motivation of Eric Holder's Department of Justice. "Republican senators filed two amicus briefs to the Supreme Court on Tuesday arguing the contraception mandate cannot stand...Another amicus brief filed by Sen. Roy Blunt (R-Mo.) and Rep. Randy Forbes (R-Va.) argues that the Department of Health and Human Services violated the Religious Freedom Restoration Act in its implementation of the contraception mandate.. Sen. Rand Paul (R-Ky.) plans to file a class action lawsuit against the NSA in the coming days... Sen. Ron Johnson (R-Wis.) has sued the Office of Personnel Management for allowing lawmakers and their staff to receive federal subsidies for their coverage under ObamaCare... Senate Republican Leader Mitch McConnell (Ky.) and Paul in December filed an amicus brief with the Supreme Court in Utility Air Regulatory Group v. Environmental Protection Agency, which could limit the administration’s power to unilaterally restrict carbon emissions under the Clean Air Act." "Reagan, for example, issued the highly controversial Mexico City Policy directive, blocking U.S. aid to organizations providing abortion counseling. This policy was immediately reversed by Bill Clinton, only to be just as quickly reinstated by George W. Bush and rejected again by Obama. The same thing happened with security classification — Jimmy Carter limited what government information could be restricted as classified before Reagan required more security controls. Then, Reagan was overruled by Clinton, who was overruled by Bush, who was overruled by Obama." During every President's second term the political conversation ultimately turns to their "lame duck" status and their future legacy. What exactly can a President accomplish in their final term, particularly with a divided government, and what will history record as their legacy? President Bill Clinton and Ronald Reagan secured their lasting legacy despite a divided government by championing policies aligned with their political opposition and confronting their own party to get that legislation passed. For Ronald Reagan, his legacy was secured with a nuclear arms reduction treaty, immigration reform, and tax reform that included raising capital gain and corporate tax rates. Bill Clinton's legacy was secured with welfare reform, NAFTA, and a balanced budget. In both cases they embraced policies traditionally associated with the opposing party. To get those policies passed, they stood up to fervent opposition from their own party. Rather than follow their lead, thus far President Obama is choosing to confront the opposition party and pander to his base in his second term. By doing so he risks leaving a legacy limited to executive orders that do not extend beyond his last day in office. Can The Buttigieg Boomlet Last? - Pete Buttigieg is getting a lot of attention for a relatively unknown candidate. but it's unclear if it can last. Trenchcoats & Gunpowder - Twenty Years after Columbine. The post Trenchcoats & Gunpowder appeared first on Ordinary Times.